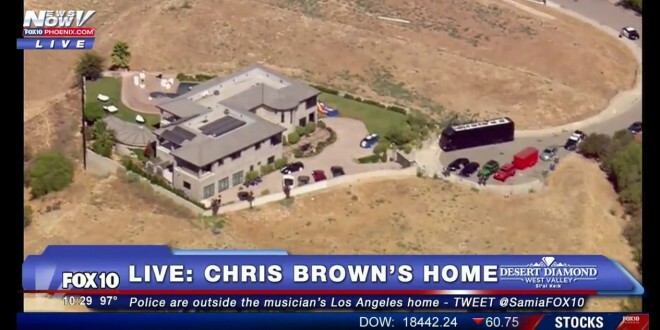 LOS ANGELES: Singer Chris Brown In Standoff With SWAT Team, Reportedly Hurls Drugs From Window - Joe.My.God. Los Angeles police are seeking a search warrant for singer Chris Brown’s Tarzana home to look for a weapon he allegedly used to threaten a woman early Tuesday morning, according to law enforcement sources. Officers responded to a woman’s call for help at the residence in the 5000 block of Corbin Avenue about 3 a.m. Tuesday, said LAPD Officer Liliana Preciado. The woman said Brown, who has had several previous run-ins with the law, pointed a gun at her during a violent rage before she ran outside to call police, according to police sources who were not authorized to speak publicly about the case. Officers attempted to enter the home and were told to get a search warrant, the police sources said. Detectives were waiting for a warrant to search Brown’s home for the weapon. Police have retrieved at least one gun, other weapons and drugs from Chris Brown’s home, after Chris threw a duffel bag out the window of his home … TMZ has learned. TMZ broke the story … cops raced to Chris’ home early Tuesday morning after a woman called 911 and claimed he pulled a gun on her. Chris posted a video in which he refers to Black Lives Matter, saying “f*** the police.” Two sources on scene tells us in addition to weapons there were drugs in the duffel bag. As for the woman who called 911 … she’s a beauty pageant title holder. Brown has been posting to his Instagram account throughout the standoff. Radio and television stations are live-streaming from the scene. The hashtag #ChrisBrown is trending at #1 on Twitter.